If you'd like to give it a try, you can find directions on how to put it together HERE. I don't have the nestabilities, so I just use an exacto knife. It's really easy! This week our sponsor is Joy from Joy's Life. One random winner will receive Joy's stamp set called You're So Punny. Please click here to visit Joys Product page. Thank you Joy! Wow! I love your card, and the fact that you made it into a card holder is even better!!! i can just see my daddy now sitting in that recliner chair. I have never seen this type of card before. Such a fun idea. Great job with the stitching. I love what you did with this challenge. OMG... totally in LOVE with this whole entire card! First it is so masculine! The cuts, the stitching but that shape! Oh what a great idea! I have so many birthdays coming up ~ I so need to do this! Have fun at lunch and great job! What a cool cool card! 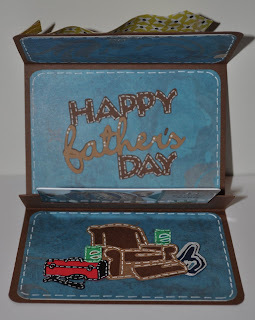 I love the easy chair and gift card slot! Me encanto el gift card! Esta hermosa la tarjeta, pero donde estan las instrucciones para hacerla???? I love this card! What a great idea, and I love the tie on the front- the whole thing is so clever! Sheila - I actually found directions online. No cricut needed :). I'll add the link to the post now! OMGosh Roberta! I love this idea for a gift card!! Great job! This is just awesome! I love that it holds the gift card in the center! I've never seen one like that. I'm heading over to pick up the instructions. Thanks for playing over at FCCB this week! That card is super cute and that fold is super fab!! I have to try it!! 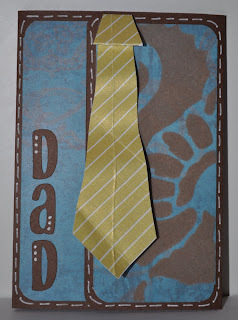 Such a cute father's day card! I love all of your projects! You are so creative! Love you did this gift card holder! Thanks for playing with us at FCCB! Very, very clever! Love all the details and the gift card is just the cherry on top! THanks for joining our challenge at FCCB! I love this!!! 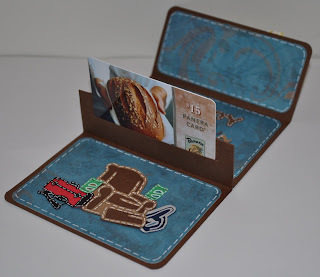 I really like how it opens like a wallet and *kapow* there is the gift card! Great Job!